benzyrnill, 旎宫嘉坊: a busy weekends with lots of gaming and playing. past weeking with too much joy. in the weekends baby played lots of pc games. i catered to him and let baby with lots of funs. yesterday his mother brought him to join a baby play yard in a supermarktet. the facility is quite new&innovative, so attracted lots of parents with their babies. baby lingered there for more than 3 hours, till he bumped onto a hard object and cried. we lunched with feature snacks from northwestern China, served within the supermarket. then baby&me slept for 2 hours, while ema tutored at home. baby soon watched baby dvds after woke up, and the night was peaceful and harmonious. this morning i felt frustrated with a nightmare. i dreamed i missing my beauties and refused compromise, then i seemingly lost all my support and left isolated, i later had to sleep on a bed with a dwarf. 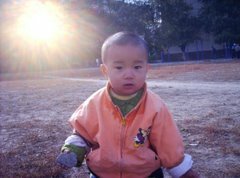 just at the moment i really left my pillar my baby son, warren zhu, gradually took and slept on bare bed, and returned to dream. the feeling of unfavorable with God let me unease, and felt frustrated. in the morning i felt very sleepy, while ema again got up early and chatter with her mom arrived. baby almost in dream told his mom he dislike to join kindergarten today. that's my poor dawn. now the sunshine likely bright outside of the window, even the curtain in office heavily blocked it. i hope i didn't miss anything i need care. i forever line up with God.